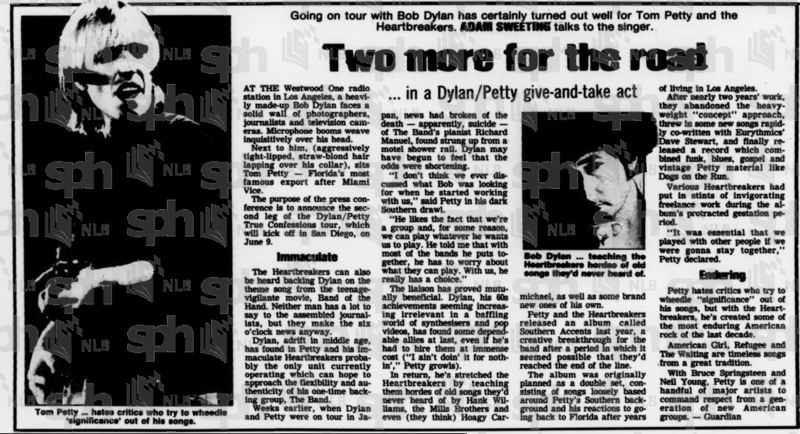 Going on tour with Bob Dylan has certainly turned out well for Tom Petty and the Heartbreakers. Adam Sweeting talks to the singer. At the Westwood One radio station in Los Angeles, a heavily-made-up Bob Dylan faces a solid wall of photographers, journalists and television cameras. Microphone booms weave inquisitively over his head. Next to him, (aggressively tight-lipped, straw-blond hair lapping over his collar), sits Tom Petty -- Florida's most famous export after Miami Vice. 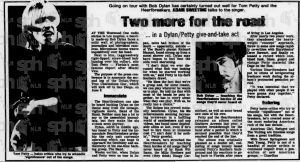 The purpose of the press conference is to announce the second leg of the Dylan/Petty True Confessions tour, which will kick off in San Diego, on June 9. The Heartbreakers can also be heard backing Dylan on the theme song from the teenage-vigilante movie, Band of the Hans. Neither man has a lot to say to the assembled journalists, but they make the six o'clock news anyway. Dylan, adrift in middle age, has found in Petty and his immaculate Heartbreakers probably the only unit currently operating which can hope to approach the flexibility and authenticity of his one-time backing group, The Band. Weeks earlier, when Dylan and Petty were on tour in Japan, news had broken of the death -- apparently, suicide -- of The Band's pianist Richard Manuel, found strung up from a motel shower rail. Dylan may have begun to feel that the odds were shortening. "I don't think we ever discussed what Bob was looking for when he started working with us," said Petty in his dark Southern drawl. "He likes the fact that we're a group and, for some reason, we can play whatever he wants us to play. He told me that with most of the bands he puts together, he has to worry about what they can play. With us, he really has a choice." The liaison has proved mutally beneficial. Dylan, his 60s achievements seeming increasingly irrelevant in a baffling world of synthesisers and pop videos, has found some dependable allies at last, even if he's had to hire them at immense cost ("I ain't doin' it for nothin'," Petty growls). In return, he's stretched the Heartbreakers by teaching them hordes of old songs they'd never heard of by Hank Williams, the Mills Brothers and even (they think) Hoagy Carmichael, as well as some brand new ones of his own. Petty and the Heartbreakers released an album called Southern Accents last year, a creative breakthrough for the band after a period in which it seemed possibly that they'd reached the end of the line. The album was originally planned as a double set, consisting of songs loosely based around Petty's Southern background and his reactions to going back to Florida after years of living in Los Angeles. After nearly two years' work, they abandoned the heavyweight "concept" approach, threw in some songs rapidly co-written with Eurythmics' Dave Stewart, and finally released a record which combined funk, blues, gospel and vintage Petty material like Dogs on the Run. Various Heartbreakers had put in stints of invigorating freelance work during the album's protracted gestation period. "It was essential that we played with other people if we were gonna stay together," Petty declared. Petty hates critics who try to wheedle "significance" out of his songs, but with the Heartbreakers, he's created some of the most enduring American rock of the last decade. American Girl, Refugee and The Waiting are timeless songs from a great tradition. With Bruce Springsteen and Neil Young, Petty is one of a handful of major artists to command respect from a generation of new American groups.